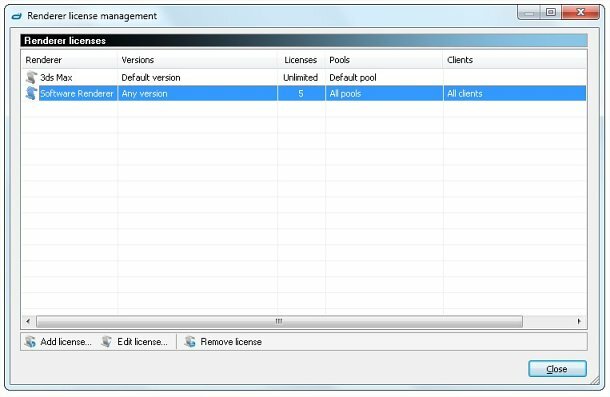 Shoran Software has released a free update to its RenderPal renderfarm-management software, adding a new licence-management system and a feature for automatically cancelling crashed renders. RenderPal 2.5 enables users to specify how many licences of each supported render engine are available, and which clients own a licence, avoiding common issues in multi-application farms. The software supports a range of common 3D packages, including Maya, 3ds Max, Softimage, Cinema 4D, After Effects and Nuke. The software also monitors CPU usage, enabling it to cancel a chunk of a render if a renderer crashes but stays open, ensuring smoother throughput. RenderPal costs €49 (around $67) for a one-node licence or €1,799 ($2,450) for an unlimited-node site licence.